Wat Thepthidaram on Mahachai Road is across the road from the old Fort Mahakarn community. Rama III built this temple in 1836, another of the many temples he built during his reign. The temple was built in honor of HRH Prince Apsorn Sudathep. Characteristic of temples built during the Third Reign, the wat has a Thai structure with a distinct Chinese decor. The gables of the buildings are embedded with Chinese porcelain pieces; numerous old Chinese statues can be seen in the temple grounds. Four old prangs, rectangular columns with sculptured surfaces reminiscent of the Ayuthaya or Khmer periods, stand at each corner of the ubosot or ordination hall which houses a white marble Buddha statue. Sunthorn Phu (1786 – 1856) the famous Thai poet, considered the Shakespeare of Thai literature, was ordained as a monk here. Ironically, he lived here after he fell out of favor with King Rama III, over poetry of all things! 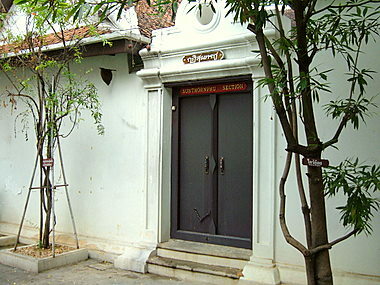 The quarters, where he spent three years of his tumultuous life, are preserved at the rear of the temple compound. Some of his unpublished manuscripts were left in his quarters after his death. But unfortunately these have been destroyed by the humidity and pests. Please see map to Wat Thepthidaram. 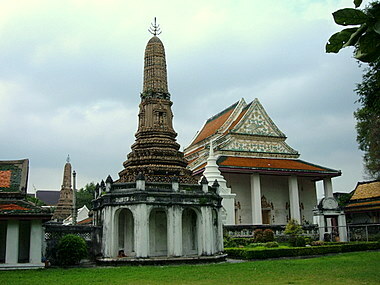 Wat Thepthidaram was declared a national monument by the Fine Arts Department in 1977. In 1986, UNESCO honored Sunthorn Phu for his outstanding cultural contributions, 131 years after his death. He was awarded the title, Great Personality of the World for his contributions to mankind. 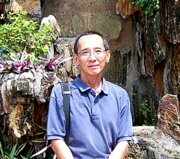 In June 2006, the Silapakorn University of Fine Arts announced that the living quarters of the great Thai poet, Sunthorn Phu, in the temple grounds will be turned into a museum. The museum called the House of the Great Poet will preserve the life and works of Sunthorn Phu to encourage more people to read his works. Unfortunately the temple is not in a very good state of repair at the time of this visit in 2004. Things haven't improved in a recent visit in 2007. However that can’t detract from its historical legacy. It was a temple built by King Rama III and lived in by Thailand’s greatest poet. The locations of Wat Ratchanatdaram, Wat Thepthidaram and Wat Saket are presented in one map as these three royal temples are in close proximity to one another. Wat Thepthidaram is about 300 m further down Maha Chai Road, opposite the century old Fort Mahakarn community. While you are there, visit Wat Ratchanatdaram, Wat Saket, King Rama VII Museum and old Fort Mahakarn which are within walking distance. For the temple where Sunthorn Phu attended school, visit Wat Sri Sudaram.